In the race for customer loyalty, excellent customer service is a major asset. We’ve looked at ways to measure customer satisfaction, but this article will go into a means to provide it: a solid and clever omnichannel strategy. There has been a lot of buzz around the term for the past few years, and having an omnichannel strategy has almost become an imperative for many companies. Here’s a look at it’s advantages, its pitfalls, and how to make the practice work for your business. “Omnichannel” customer support stems from its conceptual ancestor: “multichannel” support. 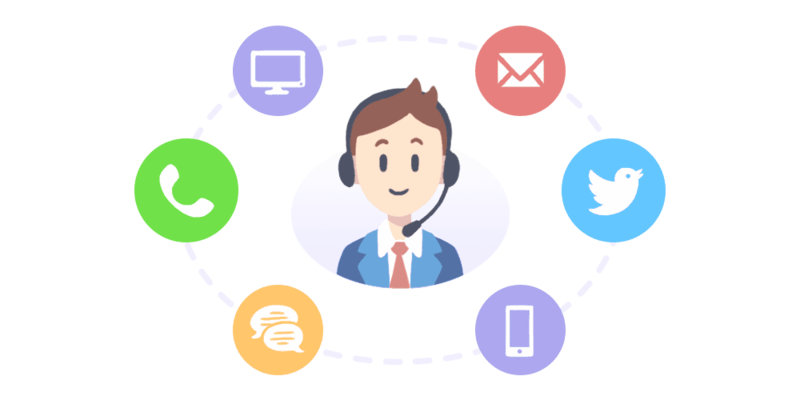 Customer support channels include phone support, email, live chat, social media, forums, self-service knowledge bases, etc. Simply put, multichannel means providing customer support over more than one channel. As a result, the customer has an easier time solving an issue with your support team, since they are being catered to on several levels. Much like “omni” means “all” while “multi” just means “many”, an omnichannel strategy takes customer support to the next level. It means taking a holistic approach to support in order to meet the rising demands of empowered customers. This means striving to make the customer experience seamless and equally satisfying across all channels. In short, the beneficial effect of omnichannel customer support on customer loyalty is severalfold. First, the effort the customer must expend in order to solve an issue is lowered, saving them time and manpower, and enabling their own success. Second, your company has a better rapport with its customers, who feel valued and empowered. And third, this increased customer loyalty and retention allows you to present your customers with upsell or cross-sell opportunities. What does an omnichannel strategy mean in practice? Nevertheless, it’s not worth it to get bogged down in the semantic difference between multichanel and omnichannel. Granted, the latter is the natural evolution of the former, but the important thing is to consider the end goal: increasing customer loyalty and retention by improving the customer experience. In the end, customers don’t care about the terms you use to define your strategy, and they don’t really care about your strategy at all, so long as it works. Customers want expeditious support, tailored to their own needs. This leaves you with decisions to make on how to set up the most efficient omnichannel strategy for your own specific situation. It could seem that the proper implementation of an omnichannel strategy is to remove all delimitations in your customer support funnel. That’s not necessarily the case. It’s possible to outsource your omnichannel support as a whole, and operate as a monolith, every channel coalescing into one. The alternative is to pick specialized tools to cover the channels you decide on, and running the show with more precision. Is outsourcing to an omnichannel service the right choice? It’s possible to employ a single service to cover all fronts of your onmichannel customer experience strategy. Many businesses have chosen to do so, often due to being short on time and resources. However, given that omnichannel support has become nigh-indispensable for many companies, the question of outsourced omnichannel strategy deserves to be given serious thought. Delegating your entire strategy to one provider has both advantages and drawbacks. Lower costs. If you resort to a single service provider, chances are the cost of subscription will be lower than those for multiple services. Centralized approach. One provider will take care of all of your channels. This means a coherent, equalitarian approach to omnichannel. Less involvement. Your time will be freed up to tend to your business’ other needs. No staffing concerns. Your provider’s team will be the ones to be involved in your customer service, so training won’t be your concern. Cost for value. If you subscribe to a package deal with your service provider, not all their features may apply to your business in a valuable way. Less flexibility. You won’t be able to cherry pick the tools specifically suited to your goals and activity. Moreover, an outsourced solution might not be easily scaleable. Less precision and control. You won’t be able to tailor the use of the solution to your particular needs and the vision your have for your company, since the strategy will be largely out of your hands. Less customer-central. Without being in the driver’s seat for your omnichannel strategy, you won’t be able to cater to your customers in the most personalized way. This could lead to a poorer customer experience, and increased churn. Overall, an outsourced, all-in-one omnichannel customer service strategy is a gamble. If your provider’s service doesn’t exactly align with your business goals, your vision, and most importantly, with your customer’s needs, you simply won’t get the most out of the service. That kind of symbiosis with an external service is a tall order. This following section aims to look at alternative ways to take a hands-on, specialized approach to omnichannel. As you’d suspect, there are several challenges facing the implementation of a successful omnichannel strategy. The solution is not necessarily to outsource this crucial step towards improving your customer experience, but rather boils down to using the right tools for the desired outcome. Here’s how to take the reins on your business’ specialized omnichannel strategy, instead of relying on an all-in-one service. The first step in developping a successful omnichannel strategy is to take an honest look at your business. What are your needs, your goals, your strengths and weaknesses, the challenges you face? Then look at your existing customer support system: what are its weak points, as far as your customers are concerned. Don’t be tempted to emulate others, since their situation will never be perfectly applicable to your own. Getting lost in abstractions will remove you from the reality of your business’ growth. For instance, a competitor may boast an enviable customer service channel such as a self-service video FAQ, a message board, or a sleek helpdesk. Though all those channels can have a great deal of merit, implementing the same initiative might be snubbed by your own customer base if they have no use for it. Stay close to your customers, gather feedback on what they really need in terms of omnichannel support. Don’t waste your resources and energy providing a support channel which won’t be useful to your customers just because you’ve seen it work elsewhere. Again, omnichannel doesn’t have to mean abandoning all segmentation. You need actionable customer insight in order to set up the best possible strategy. The way to get this kind of insight is to collect data pertaining to your customers’ habits, expectations, and needs. Studies show that omnichannel setups often fail due to poor data, and poorer data collection, so this operation is crucial. One way to gain this insight is to simply ask your customers what they need, in the form of surveys. This is very straightforward, and can be just as effective, if done right. The trick is to not be invasive, and find ways to garner honest insight from a representative sample of your customer base, not just from the outliers with extreme opinions on your customer service. The other way to glean information on your customers is to collect it without directly involving them. The time spent on your website, the pages visited, the reactions to changes you implement in your product, there are countless metrics to track in order to understand your customers. Once you’ve picked the metrics which interest you (after you’ve hatched a solid plan), you can start collecting the data relevant to a solid omnichannel strategy. Use data to find out which channels are most useful to your current customers. Identify the channels most used by your prospective customers. Be active on those channels, respond quickly and efficiently, make them an asset to both your team and your customers. However, data collection, monitoring, and analysis is an endeavor as time-consuming as it is necessary. This is where you can start picking the right tools for the job, instead of delegating. There exist many services dedicated to data collection and analysis which can take over the grunt work. Your human capacity for reasoning is a part of the process, no doubt. Nevertheless, the right tool can facilitate the gathering of information, benefiting your customers and your business. We’ve seen how an all-in-one omnichannel support provider is incompatible with a hands-on approach to the process. If you’ve settled what your company and your customers both want to gain from your omnichannel strategy, now you can start experimenting with tools. There exist services for every aspect of an omnichannel setup. Every one specialized in an area, and provides a relevant solution. The programs are kept up to date, upgraded with new features, and free you up to use the channels they offer. Furthermore, the real strength of many of these providers lies in their ability to integrate with each other. This makes for for a truly seamless omnichannel experience. Picking several providers instead of a single one allows you to rely on a real specialist for each channel, instead on of a jack-of-all-trades. You have your pick of companies offering a service specially designed to empower your business. This includes specialists working to facilitate the implementation of an omnichannel strategy. Since these services are designed to work together, you can pick the tools to favor your unique business profile and the particular needs of your customers, while retaining control on your support system. Nowadays, businesses can choose a trusted specialist for every area of customer service. You can have a service for phones, one for live chat, one for your FAQ, one for email, and so on. This affords your business an incredible amount of precision and competence for each channel you choose to use. However, this doesn’t mean that your team must split into independent factions. While you rely on different service providers to set up support channels, your support team must be equally at ease with all of them. Otherwise how can you hope for your clients to do the same? One of the risks of a faulty omnichannel strategy is finding yourself with a segmented support team. This means employing people to strictly work over email or over the phone. This is a recipe for agent burnout, and for an unsuccessful and unsustainable strategy. Customer service is everyone’s job. A successful omnichannel strategy makes it easy for everyone to move seamlessly between channels, clients and support team alike. A successful omnichannel strategy is about having the proper tools at your disposal, but also about making sure your team can use them to their full potential. The shift to an omnichannel strategy has to be gradual. The objective is a flexible and resilient customer support model. Train your support staff as a whole, without barriers between channels and teams. Hire people with hybrid skills, empower everyone to get a handle of every tool, and incentivize your team with common KPIs. Regular coaching sessions will keep your team proactive and on the same page. You also need to empower your customers to get the most out of the channels they already use. You can adopt service tools to create interactive, self-service FAQs and knowledge bases. This is useful to save your customers time and effort, as well as direct them to the channel most suited to their problem, should they be unable to solve it alone. This way, everyone be more efficient (in the case of someone calling in sick, anyone can take over for anyone else). Furthermore, the ease with which your team navigates your channels will transfer to your customers. In conclusion, having a successful omnichannel strategy doesn’t mean that you need to be equally active on all fronts. Rather, pick the right tools for your business and for your customers, and stick to it. This way, so you don’t need to be everywhere but can be exactly where they expect you to be.